Fa-la-la-la-ugh! The holiday season is a stressful time of year for most people. For those of us who are working to quit smoking, the holidays can be especially challenging. When we're tired and run down, cravings to smoke will seem stronger while we feel less able to manage them. Get enough sleep at night and take a power nap during the day if you can. Many of us reach for a cup of coffee when we need an energy boost, but too much caffeine can leave us feeling jittery and stressed. Avoid extra cups of coffee to stay awake. Rest if you're tired. Not only is water a great craving-buster, it's an essential ingredient in a healthy diet. Keep yourself well-hydrated and you'll feel better in general, which will in turn help you manage holiday stress more easily. Enjoy holiday treats, but be sure to give your body the fuel it needs to function properly. Eating a well-balanced diet rich in fruits, vegetables, protein, and complex carbohydrates will help keep you at your best, both physically and mentally. Walking reduces stress and improves circulation. It also releases endorphins, the "feel good" hormone. So, when the urge to smoke strikes, head out for a quick walk around the block. You’ll come back refreshed and relaxed. If the weather is bad, use the treadmill or take a walk at an indoor mall. Deep breathing is a quick way to reduce stress. Breathe in through your nose for a count of three and exhale through your mouth for a count of three. Repeat this for a few minutes, and the tension in your body will begin to fall away. While you're running around taking care of holiday tasks, be sure to schedule a little me time daily. Take a hot bath or spend a half hour in a quiet corner with a good book (or both). Choose activities that replenish your energy and renew your spirit. Avoid a piling on of stress and you'll find it easier to manage your holidays without reaching for a cigarette. It only takes a few minutes with a cup of tea and honey to feel the stress of the day begin to slip away. Choose herbal teas rather than those with caffeine. It's a quick and easy way to rejuvenate yourself. Use a daily list to help you organize tasks. Don't overwhelm yourself by looking at the whole picture: Keep things simple and in the present moments of the day you have in front of you. You'll be more efficient and less stressed. We are often our own worst critics. You're working hard to quit smoking, so give yourself permission to loosen your expectations a little for this holiday season. In other words, don't try to do it all. Think instead in terms of what is good enough rather than stressing over every detail. Meditation is another great tool. Close your eyes and create a place in your mind that you can visualize when you need to slow down and relax. Return to the same imaginary location every time so that it becomes familiar and comfortable. As you settle in, focus on your breathing, and slow it down gradually. Breathe deeply in and out for three to five minutes. Enlist the help of others to complete holiday tasks. Involve family members and friends; they're usually happy to help if asked. It's so easy to take too much on this time of year. Make a list of things you'd like to accomplish and prioritize them. Decide what things must be done, and what things could be let go if need be. Sometimes less is more! Don't threaten your smobriety with worries about money. Make a holiday budget and stick to it. Don't lose sight of the bigger picture during the holiday season. The reasons you quit smoking are as valid today as they were the day you quit. Take five minutes and refresh your memory by reading your list of reasons. If you get the holiday blues, take steps to acknowledge and manage your feelings. Denial only makes holiday depression worse. Take a few minutes to connect with someone you care about. Your spirits will be lifted, and chances are you’ll lift theirs too. Spend some time reflecting on all of the things in your life that you’re grateful for. It's a simple yet powerful way to pull out of a slump and renew yourself. Smoking cessation is a process of gradual release over time. The associations we've built up between smoking and the activities in our lives over the years must be changed, one by one. And the only way to do that is by simply living life, day in and day out, smoke-free. Navigating the holidays minus the cigarettes is a necessary part of the journey. 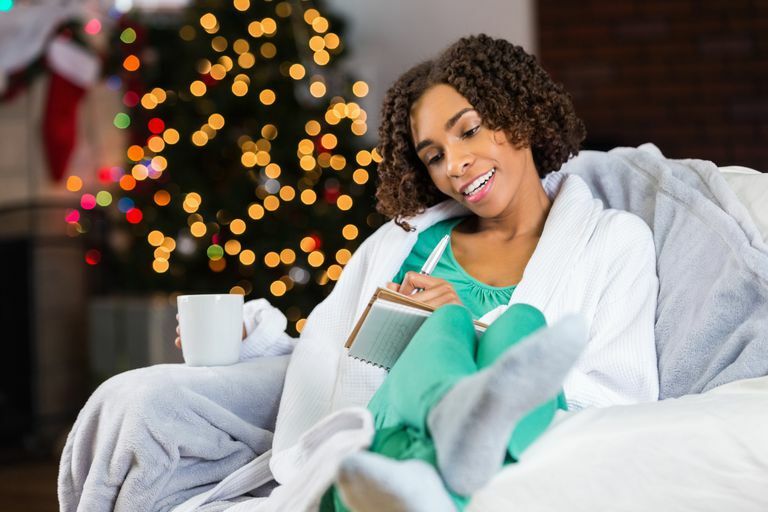 While this first smoke-free holiday season may feel uncomfortable or downright difficult at times, you're working to cement new habits in place. Keep your focus and meet the challenges that come along with confidence. You can do this, and you'll thank yourself when the holidays are behind you and you're still smoke-free. Have a great, smoke-free holiday season!